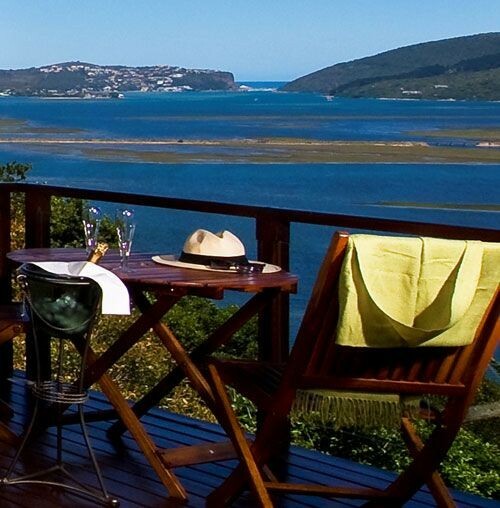 Magnificently set overlooking private indigenous forest, the famous Knysna Lagoon and Heads. Kanonkop House offers boutique accommodation and personal service. This family owned five-star guest house, provides easy access to world-class golf, excellent cuisine, shopping and a wide range of activities that explore the natural beauty of the area. Each of the sumptuously luxurious rooms is beautifully and individually appointed with every convenience including a private balcony and gorgeous views. 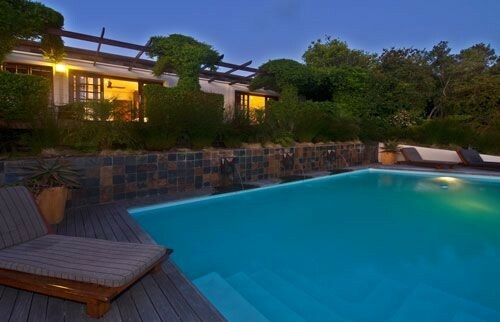 Gloriously situated at the apex of Kanonkop Hill and commanding a breathtakingly beautiful view of the lagoon and famous Knysna Heads beyond, Kanonkop House offers 5 star boutique accommodation with a uniquely personal touch. Kanonkop House is 5 minutes from the centre of Knysna, 5 minutes from the Waterfront, and is easily accessible and well signposted from the N2 highway. 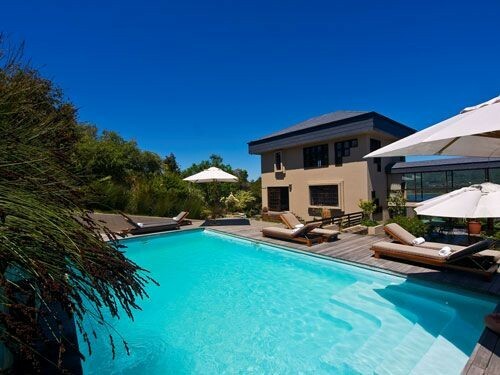 Chris Conyers, his son Mark and daughter Samantha own and manage Kanonkop and the exclusive use Knysna Heights Villa (see later) and have established a reputation for relaxed luxury and personal attention. 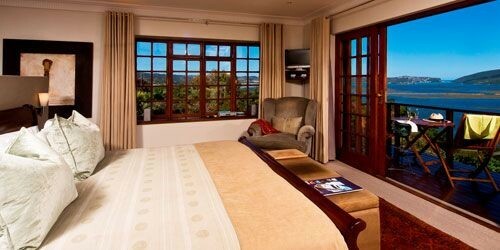 Kanonkop has 5 beautiful rooms each with their own character and beautiful views. They are individually created and named and gorgeously decorated incorporating the ideas and artwork of talented South African artists. 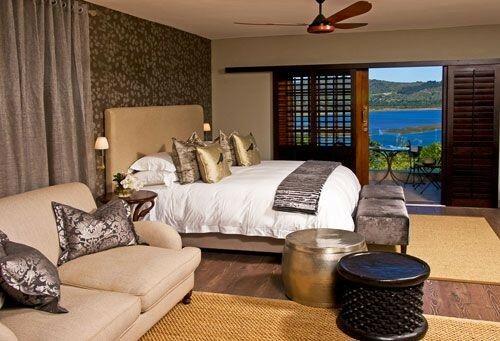 'Paradise' - rated as the "best room in Knysna" (Frommer's South African Travel Guide) certainly lives up to its name, and the views from the private wooden balcony over the forest and lagoon to the famous Knysna Heads are out of this world. This luxurious king-size bedded room has under carpet heating, large hand-made paddle fans, a king size bed, reading nook, dressing table and includes a CD player and selection of music, a wall mounted satellite television and tea/coffee making facilities. The large open plan bathroom (separated from the bedroom by wooden shutters only) includes an oversized raised bath with beautiful views, separate shower, his and her basins, and towel heater rails. Original artwork and small touches including aroma oil burners, candles, bath products, bathrobes, slippers etc. add to the experience. A drawer of thoughtful extras include binoculars, hairdryer etc. For guest convenience there is an electronic safe in the cupboard. New 'Sunbird' (Summer 2008/9) - is a king-size bedded room which also can be converted to two single beds. This luxurious, light and sunny room leads out to a large balcony and outdoor seating area with uninterrupted views of the lagoon on the southern side and sliding doors on the northern side open into the garden and pool area. Sunbird features an open plan comfortable reading and TV area with couches, a work desk, a separate bathroom with a raised bath and separate shower, dressing room electronic safe, tea and coffee station. New 'Forest' - is a very special king-size bedded room (which can be converted to two single beds if preferred). It features an open plan Italian bathroom with egg shape bath, separate shower, his and hers hand basins, separate toilet and a mix of beautiful antique and contemporary furniture. The modern quartz pebble floor includes underfloor heating. Forest room also features a lovely lounge area with satellite TV, work desk, and coffee and tea station. Large sliding doors open onto a big private wooden deck where guests enjoy a view of the indigenous forest with sparkling sights of the lagoon captured between the trees. 'Sivuyile' ("Be Happy") and 'No Matata' ("No Worries") are large and luxurious suites and open out onto a wooden sundeck. These queen-size bedded rooms overlook the pool, garden and Knysna Lagoon in the distance and include a handmade wooden paddle fan, original art work and a comfortable seating/reading corner with a selection of reading material. Each room has a separate en-suite bathroom including a full size bath and separate shower. Conveniences include a tea/ coffee station and Satellite TV and electronic safe, aroma oil burners, candles, bath products, bathrobes, slippers, hairdryer, electronic safe etc. Each room has capacity for a third single bed to be added if required. On warm days breakfast is served on the patio where guests will enjoy the lovely views and sights of the tiny iridescent double collared sunbirds. If the weather is inclement, breakfast is taken in the elegant dining area adjacent to the guest bar. The indigenous garden has a sun splashed ten meter pool with a big deck, lounges and umbrellas. Complimentary Bar - residents can enjoy complimentary drinks (wine, beer, spirits and soft drinks) 24 hours a day. Tea, coffee and light refreshments are served on arrival. Golf: Kanonkop Guest House has corporate memberships at the stunning Pezula and Simola Golf courses and offer their guests access to these courses at reduced prices. The family ensures a complete golfing holiday by providing advice, booking tee times and organizing transfers or golf club hire at these and the many other golf courses in the area. In-House Activities: Available in house are canoeing (including picnics), mountain biking (including transfers and permits), speedboat cruises (including a sunset cruise), all water sports, skiing etc (including tuition) and fishing. Restaurant recommendations and any other bookings or trips that guests request are gladly made by Chris, Mark and Samantha. They will ensure that guests experience in the relaxed atmosphere of Kanonkop is especially personal and truly memorable. 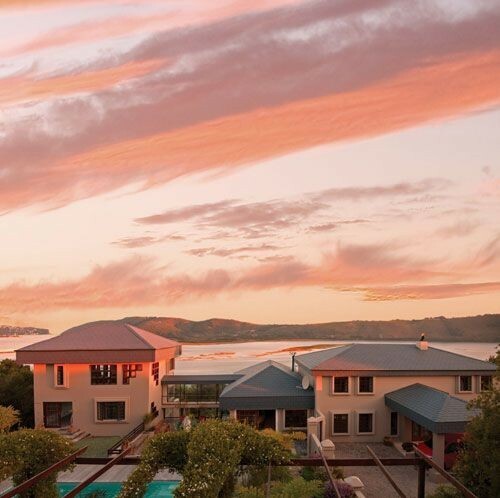 This beautiful new split level house in the heart of Knysna is suspended over the indigenous forest with stunning views to the famous Knysna Heads over the lagoon and forest. Oversized front doors open to the large entrance hall and lead to the spacious open plan living area. This level contains the fully equipped modern kitchen with granite bench tops, dishwasher, microwave, electric oven and hob, the family room with comfortable couches, open fire place, large plasma screen, satellite television, CD, DVD, the dining room with table for 8 and a spacious formal lounge area. The living areas are all connected by beautiful stained wooden floors and enjoy stunning views through the wraparound glass doors and from the entertainment decks that surround the house on every side. 3 ENSUITE KING BEDROOMS with single bed conversion option and under-carpet heating. Upstairs Bedroom (1): This luxurious upstairs bedroom has a reading corner and private balcony overlooking the forest and lagoon. 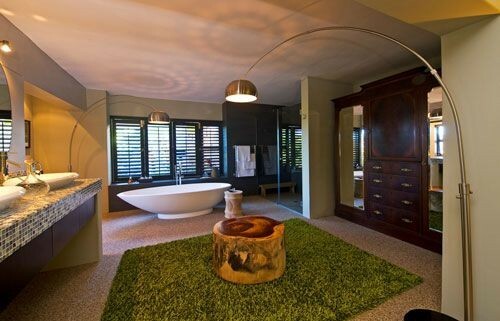 The large en-suite bathroom offers separate bath and shower. 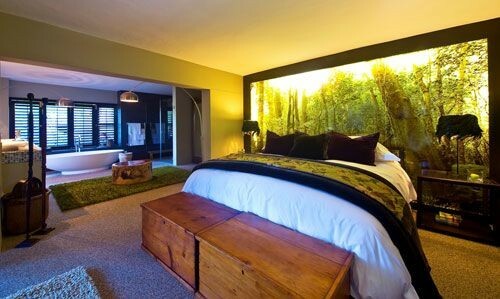 These spacious rooms offer an intimate view of the indigenous forest and birdlife. Each has a bath or shower en-suite. Small touches include bath products, gowns, hairdryer and a personal safe in each bedroom. The Villa is fully serviced and full breakfast (continental and/or hot) is hosted daily or as required.The fridge is stocked with complimentary wine, beer and soft drinks for guests' enjoyment. Music from the fully integrated music system is available throughout the house. The house is also available on a self catering basis.